Paperless is a digital documents manager. Remember when everyone talked about how we would soon be a paperless society? Now it seems like we use paper more than ever. Let’s face it – we need and we use paper. But Paperless 2 is one of those incredibly useful applications that will help you manage all your paper and digital documents and at the same time positively affect the environment. When it’s tax time no more bringing a shoebox full of receipts to your accountant. According to ruling Rev. Proc. 97-22 from the IRS, a digital document is acceptable. With Paperless 2 you can create a Smart Collection and keep all your documents neat and tidy and in one place. Additionally, once you store your receipts in Paperless 2, you can select the receipts to email, print, or export to PDF, or even show as a chart. Paperless 2 has the ability to keep up and maintain the task of not only reducing your need for paper but managing the paper you use. Simply scan your receipts, bills, statements, warranty cards, business cards – any paper document and the OCR function of Paperless 2 recognizes the data and adds it to the Details Window. 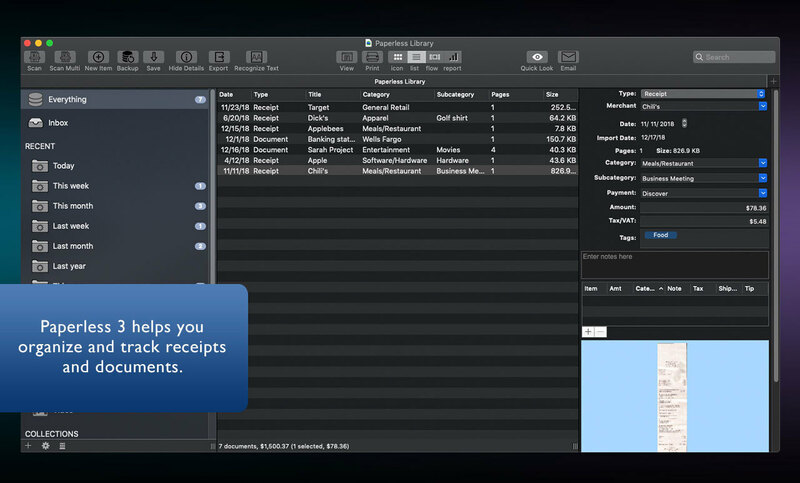 The built-in search functionality even lets you find and organize receipts and documents into Smart Collections. Already have your documents as PDFs or other file formats? No problem. Simply drag and drop them into Paperless 2. By taking your paper receipts, product manuals and other documents and creating an electronic record you’ve already reduced your need for paper.